The Mnajdra Temples will be open to the public between Thursday and April 19, except for Good Friday, following the installation of all the panels making up their new shelter. Ħaġar Qim Temples, which are also getting a protective shelter, will be open during the same period. Some work remains to be done on the shelters so the temples will be temporarily closed again after that. The shelters, on which work started last summer, are intended to mitigate the effects of the elements on the prehistoric temple structures. 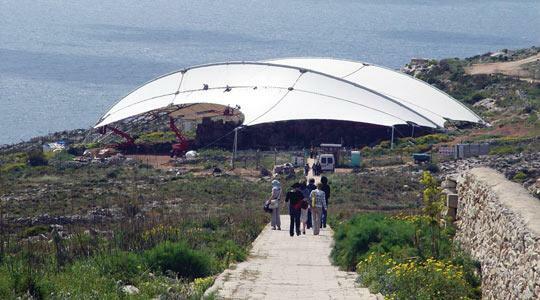 However, two panels at Mnajdra were torn by recent strong winds during the installation process.